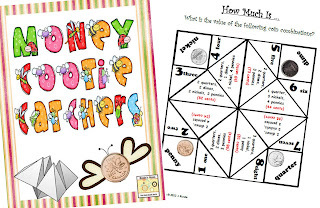 I've just finished another set of cootie catchers - these ones are for reviewing money concepts. 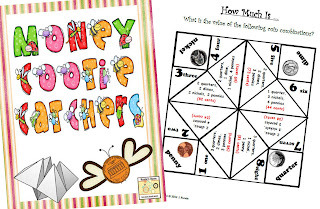 I'm still trying to build all my math centers for next year, and I'm planning to include a set of cootie catchers in each tub. I also haven't taught money yet this year. My grade 5/6 students should come to me with a good understanding of money, so I was looking for a quick way to review this with them before our testing. 3 for making change (change from a quarter, change from $1.00, and change from $5.00. The set is available for sale at both my TPT and TN store for $3.00. This set has pictures of Canadian coins. See it at my TPT store or my TN store by clicking on the store links. This set has pictures of American coins. See it at my TPT store or my TN store by clicking on the store links. AND ... just because I like you ALL so much ... the first three to leave a comment with their email will get a FREE copy (let me know if you'd prefer the American or the Canadian version). What an awesome way to practice these skills! American Version, please, if I'm a lucky winner. These are already on my wishlist! And that's three!!! Thanks, ladies. I'll send the emails out shortly! I hope you enjoy! @Runde do you have PRE-ALGEBRA and ALGEBRA foldables? I love the Math Journal Sundays and they are helping my child greatly! He has dyscalculia and struggles with math...he did "ok" in his 1st semester of Algebra but is failing the 2nd and will fail the yr and repeat it next year. I used to homeschool but he chose to go into public school :( I KNOW foldables and a journal would help him...I just am not sure I can implement the idea on my own...any help or suggestions is greatly appreciated! Thanks!! Rewa, my student don't do a lot of algebra in these grades - but it is part of our patterning units. I do have some patterning foldables - mostly just activities for finding the rule and input/output flaps. They should be near the beginning of my math journal posts if you're searching through my math journal posts. Thank-you SO much, Elizabeth! I'm so glad your students love these as much as mine do! I HEART your cootie catchers!!!!! I just added it to my TpT wish list!!!! Oh my goodness - I DID send them out that night. I'm so sorry you didn't get them. I just sent them out to you again. If you don't see them, maybe check your spam filter. I've heard that sometimes emails with attachments get sent to the spam folder. Let me know if you got them! Thanks so much! speckledtrout100@yahoo.ca is an alternative email address. Are you also gearing up for the "big test"? OK - just sent them out again. I HOPE this works for you!!! Let me know! Thank you so much for sharing! I just found this site! !